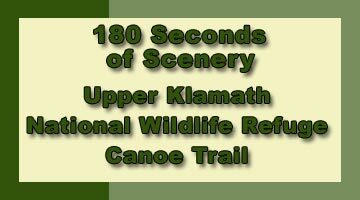 Upper Klamath National Wildlife Refuge - Explore! 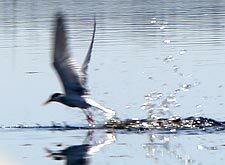 Upper Klamath National Wildlife Refuge - Explore! by Canoe . . . The Upper Klamath National Wildlife Refuge is one of six National Wildlife Refuges in the Upper Klamath Basin of Oregon and California. It is located on the north-western shore of Upper Klamath Lake near the Oregon community of Rocky Point. With almost 15,000 acres of marsh and open water, but no uplands, there are no roads. The only option for exploring the refuge is the canoe trail. The canoe trail is marked and is almost 10 miles long. It traverses Crystal Creek and Recreation Creek. These creeks arise from crystal clear springs that are fed by snowmelt from the east side of the Cascade Mountains. As they flow through the marshlands, the streams pick up tannin that give them a brown tint. As you explore the trail, you may see muskrat, beaver, river otter and some very large trout as well as a huge array of bird species. First, you’ll need a canoe or kayak. If you don’t have one of your own, rentals are available at the Rocky Point Resort. Next, you’ll need a launching point. We used the Rocky Point Boat Launch (42˚ 28′ 40.30″ N – 122˚ 05′ 14.21″ W), just north of the tiny community of Rocky Point and just south of the Rocky Point Resort. The other option is the Malone Springs Boat Launch (42˚ 31′ 49.40″ N – 122˚ 05′ 09.73″ W) at the northern (upstream) end of the canoe trail. Both are operated by the U.S. Forest Service and are free to use. We chose the Rocky Point Boat Launch and headed upstream on Recreation Creek because we didn’t want to be paddling upstream at the end of the day. Finally, you need to choose a route. As you can see by the map, the northern end of the trail offers only an up and back option. The southern part of the trail is a figure eight with all the possibilities that offers. We started late in the day and took a route of about 5.3 miles. We proceeded two miles upstream on Recreation Creek to its junction with Crystal Creek. Then we headed downstream on Crystal Creek to the Wocus Cut, a relatively shallow passage through the marsh, and back to Recreation Creek and the boat launch. Late in the day, winds tend to pick up from the west. Thus, we didn’t want to be in the open water of Pelican Bay fighting wind, after a day of canoeing. Eliminating the upper portion of Crystal Creek from our journey was simply a matter of time. If you can include that portion in your adventure, we highly recommend it. The water is clear and deep and you’ll be very likely to see large trout in the water and river otters frolicking along the shore. One caution. The water in the Wocus Cut that connects Recreation Creek to Crystal Creek is fairly shallow. Typically water levels drop during the summer so that sometime in August it will no longer be passable for canoes. Don’t try portaging across the area. The mud is way too deep for that. Recreation Creek follows along the western shoreline of Upper Klamath Lake. You’ll see recreation residences and forestlands of the Fremont-Winema National Forest to the west. To the east is marshland. The surface elevation on the water in the creek and wetlands matches the surface water level of Upper Klamath Lake. Nonetheless, there is water flowing down Recreation Creek, actually a channel through the marsh, creating a weak current. Crystal Creek begins several miles north of the canoe trail and meanders through the marshlands before being designated a part of the trail at Malone Springs. If you wish, you can paddle northward from Malone Springs for an expanded adventure. Crystal Creek continues southward from Malone springs for a couple of miles to the point where recreation Creek splits off. That’s about two miles north of the Rocky Point Boat Launch. The creek continues on through the marsh and empties into Pelican Bay at the south end of the refuge. Like Recreation Creek, it is essentially a channel through the marsh and carries a weak current. The Fish and Wildlife Service has erected some birdhouses along Recreation Creek. We saw a swallow exiting one as we went by. There are quite a variety of birds. We saw grebes, redwing blackbirds, Franklin’s gulls, black terns, ducks (including a family with 10 ducklings), a cormorant and others we weren’t able to identify. Morning and evening are better times for watching birds. You might also see hawks, eagles, white pelicans, Canada geese, coots, kingfisher and osprey. During the spring and fall migrations a large variety of smaller birds travel through the trees to the west of the trail. While they are mostly active at night, you will see evidence of beavers in the form of their lodges. It’s common to see river otters along the upper part of Recreation Creek and the upper part of Crystal Creek. You might also spot a muskrat. Even if you don’t see any frogs, you’ll surely hear them. At the time of our visit, the wocus lilies were in bloom. 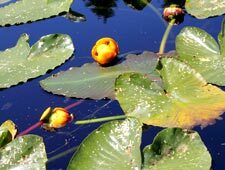 The bright yellow flowers extend above the floating lily pads. This plant was known as Wok?sam to the Klamath Tribe. Each fall the natives would gather the seed pods, grinding the seeds into flour and drying the seed cases for use in dyeing their baskets. The flour provided the indigenous people with food through the winter and was also a trade good. The scenery along the canoe trail is outstanding both in the foreground and the background. Foreground views range from open water to marsh to upland forest. Background views include the peaks of the Mountain Lakes Wilderness to the south and Mt. Scott and the peaks of Crater Lake National Park to the north. Just getting out into a canoe adds to the adventure. 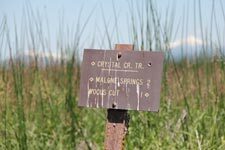 While the trail is marked, it is possible to get off the trail and lost in the marsh and, if you wish, you can extend your adventure northward from the canoe trail. The variety lies mostly with the scenery and the various types of wildlife you see along the way. There is history surrounding the refuge, including the early Klamath Tribal uses of the area, a visit that John C. Fremont made through the area on one of his expeditions, the supply trail to Fort Klamath, Point Comfort Lodge (1912), early steamboat traffic and more, but none of this is interpreted for the casual visitor to the Wildlife Refuge. Kids love to go canoeing and they can also swim in the area around the boat launch. Overall, we gave this adventure a rating of 6.0 on our scale of 1 to 10. If you have experienced this adventure, we welcome your comments below. The text and all photos are by Jerry Haugen and ©2011 by Global Creations LLC, all rights reserved. Trish Haugen shot the introduction section of the video. Jerry shot the remainder and produced the video. The video is ©2011 by Global Creations LLC, all rights reserved. The Canoe Trail Map is provided courtesy of U.S. Fish and Wildlife Service. It’s a great year-around trout fishery. I have a fishing kayak . Is it legal to fish in the canoeing trails ?